Brain cancer growth. 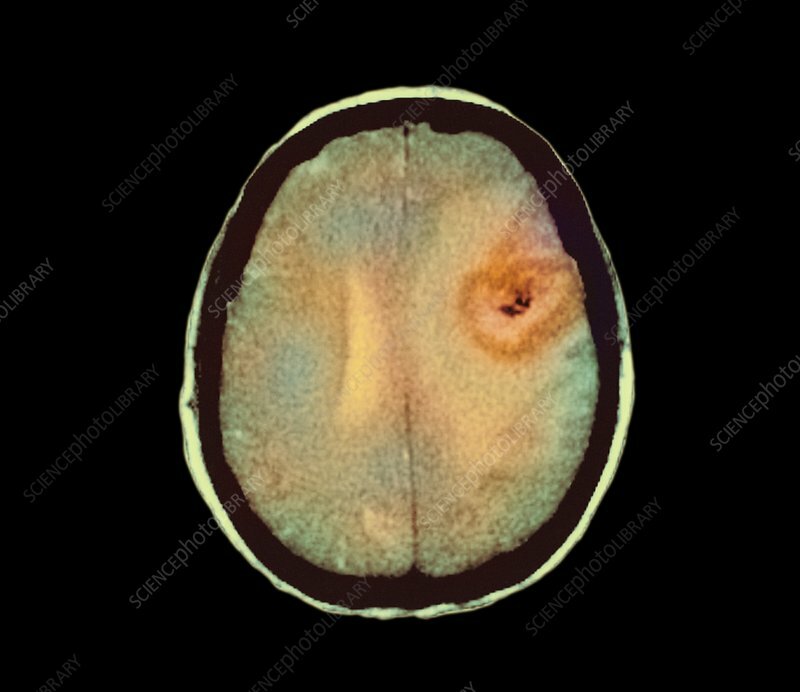 Coloured computed tomography (CT) scan in axial section through the head of a 49 year old man with a malignant astrocytoma brain tumour (orange, upper right). This cancer arises from astrocytes (a type of supportive glial cell) in the brain. The cancer's growth presses on and distorts the surrounding brain structures. Effects of this can include seizures, headaches, sensory disturbances and speech disorders. Surgery to remove part or all of the tumour may relieve some symptoms, and radiotherapy and chemotherapy may be used, but the prognosis is poor. For growth of this tumour around 10 months later, see image M134/498.